We know our most immediate ancestors are of German decent who immigrated to the U.S. from the Crimea area of the Ukraine in the late 1800’s and prior to that in the area once known as Prussia. There are many different spellings in the official records: Jauk, Jaak, Schaak, Dzaak, Dzauk, Dzauck, and Dschaak. Apparently, the official records most often were wedding and birth records which were recorded by the local priest. They often entered the name phonetically, which is why you find so many different spellings of such an unusual name. Dschaak is unique even in the Germanic areas. 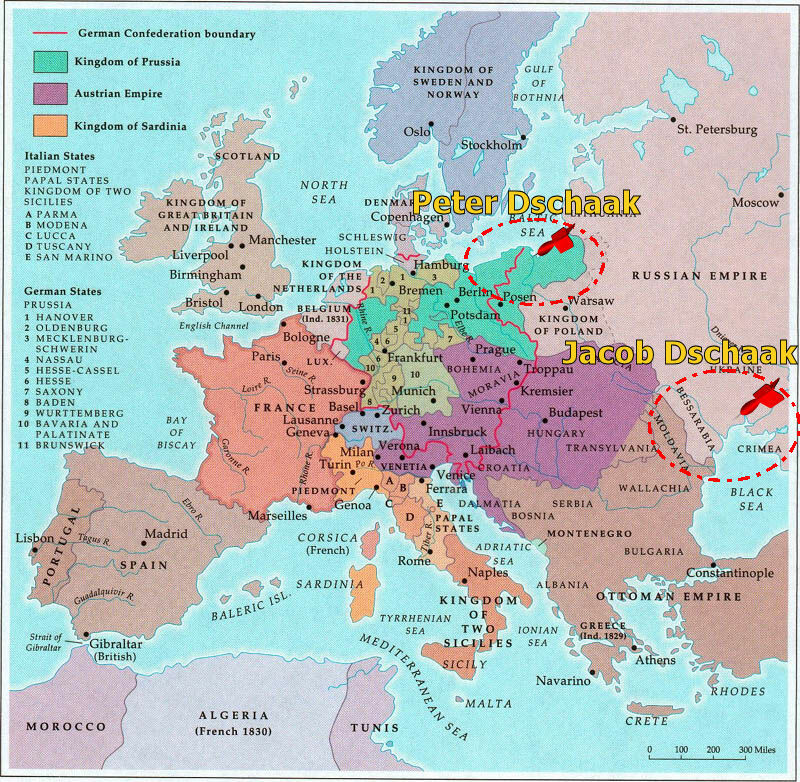 Based on a letter from Dr. Joseph Height (circa 1970) the French name Jacques was germanized into Dschaak (and various other spellings) during the days of the French Huguenots. The Huguenots were contemporary with the Lutherans in Germany. In the mid 1500’s they became a large and influential political group. They were persecuted by the Catholic government. In 1572 the government began the Massacre of St. Batholomew’s Day in which thousands of Huguenots were killed. Many of the Huguenots left France for Holland, America, England, and Prussia. We can track the Dschaak family back to Prussia, which lends to the theory that they were originally French Huguenots. It does say that is the “theory” on where Dschaak came from, so it is not the definitive answer. Alex Dschaak signs with Marshall University (Swimming) Welcome to the Dschaak Family website.